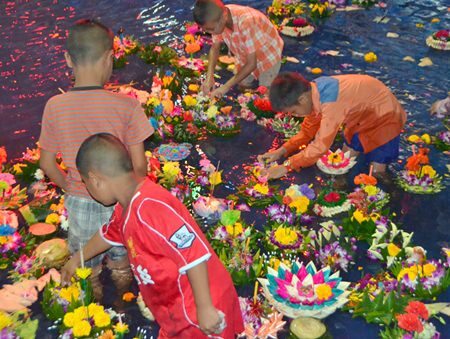 Loy Krathong this year was as vibrant as ever, with throngs of people turning up at Pattaya Beach, Jomtien Beach, local temples and at Lan Pho Public Park in Naklua to launch their krathongs (floats) of flowers and incense. 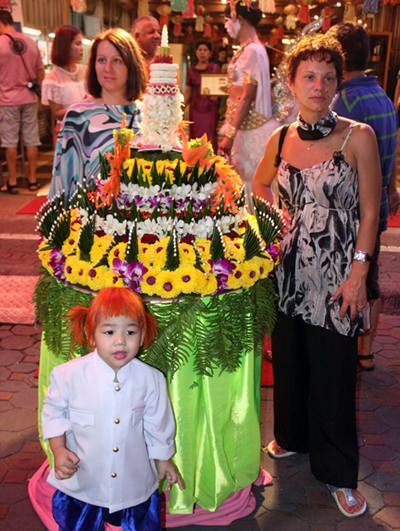 Mayor Itthiphol Kunplome commented that Loy Krathong provides a good chance for foreign guests to not only experience true Thai culture, but also to see people wearing traditional Thai costumes, as seen here on Walking Street. 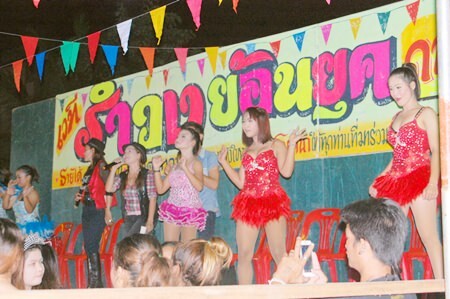 Pattaya’s decision to consolidate its usual two official Loy Krathong celebrations into one proved a success as tourists and locals turned up at Lan Pho Public Park for a krathong competition, Miss Noppamas pageant for young girls, a country music concert from the P Saderd Band, booths selling food and drinks, and vendors selling locally made products. Loy Krathong this year was as vibrant as previous years. 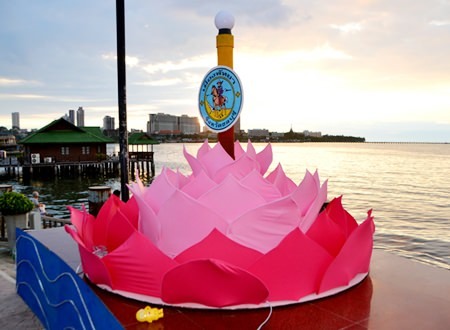 People came out to Pattaya Beach, Jomtien Beach, local temples and at Lan Pho Public Park in Naklua to launch their floats of flowers and incense. Most were made of natural materials, in accordance with the government’s policy to conserve the environment. 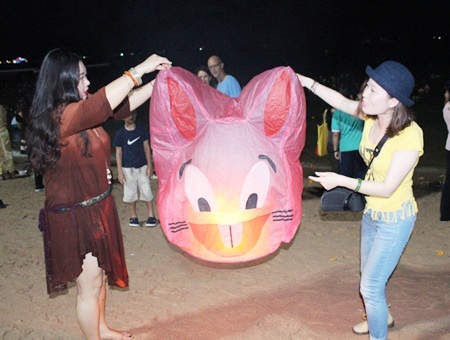 Tourists release a cartoon lantern. Most tourists and Thais were aware of the environmental problems posed by plastic krathongs, but some still used foam floats. The sun sets behind a giant krathong on Beach Road Pattaya. 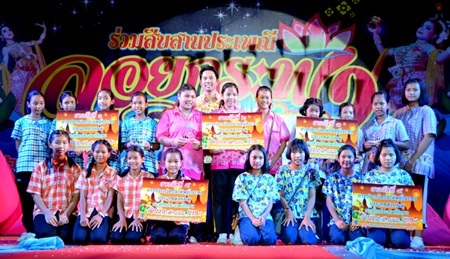 Pattaya’s krathong contest awarded prizes for both the most-beautiful krathongs in three categories: public, elementary and high school students. 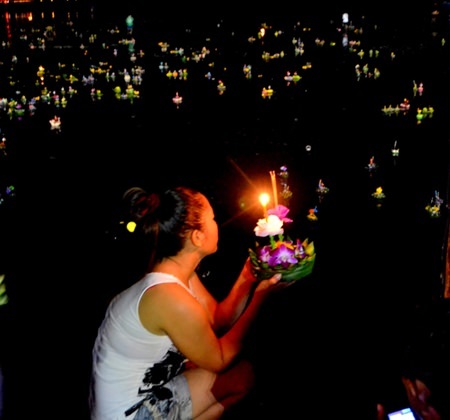 A second contest awarded prizes for the most-creative krathong. All krathongs had to be made from natural materials. 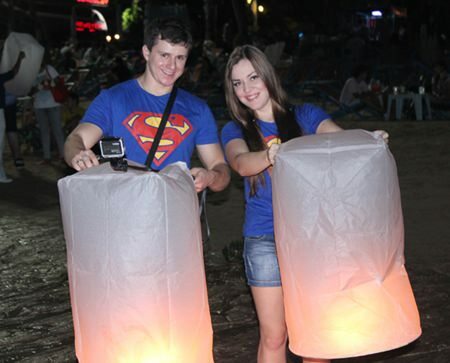 A foreign “super” couple lets go of a lantern for good luck. Mayor Itthiphol Kunplome and members of the Pattaya City Council join people in floating their krathongs at Lan Pho Public Park. 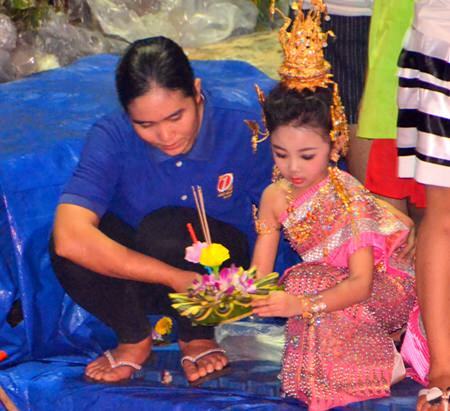 A Nong Noppamas contestant floats a krathong with her mother after the contest. 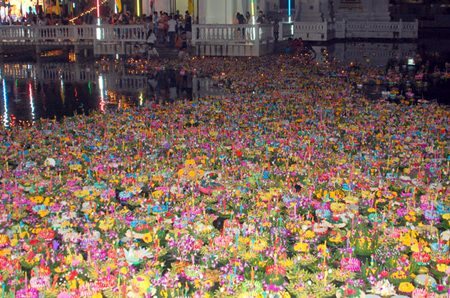 Thousands of krathongs were floated during the evening. Staff at entertainment venues on Walking Street were having a vibrant time. 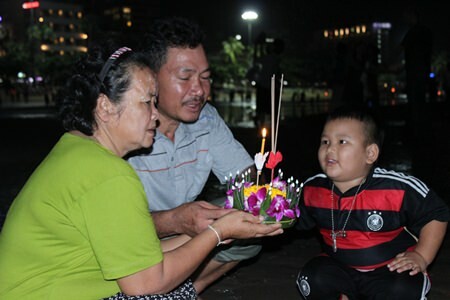 A family makes a wish before floating their krathong into the sea at Pattaya Beach Soi 4. Tourists stroll along, looking at beautiful krathongs on Walking Street. 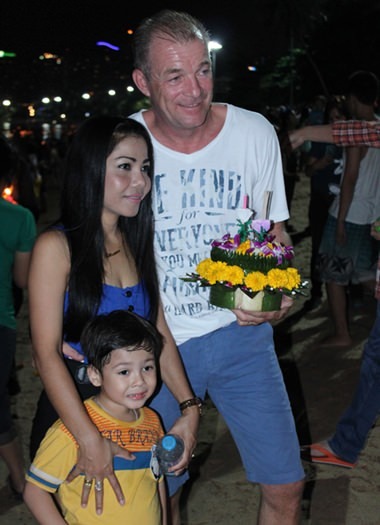 A lovely family prepares to loy their krathong. 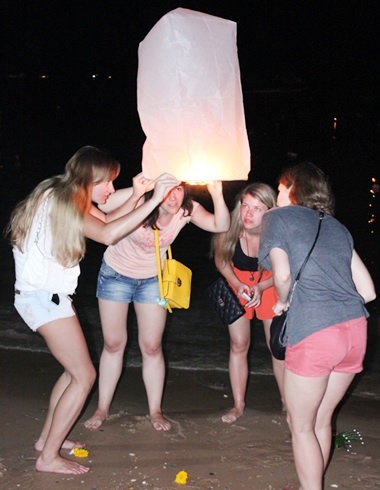 Foreign teenage girls float lanterns together. This Nong Noppamas contestant is very patriotic. 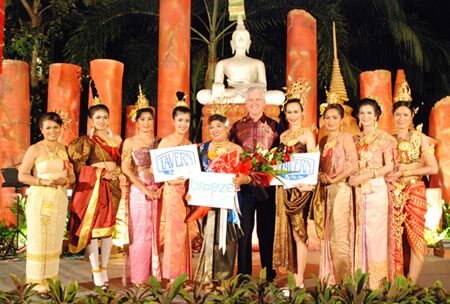 Amari Pattaya General Manager Brendan Daly (center) presents awards to Nong Noppamas contestants, including winner Nilobol Yusawat (5th left) from the Kitchen Department. Manaschanok Thabthone (4th left) from the Front Office Department finished runner-up, whilst Anusara Songkarin (4th right) from the Food & Beverage Department (Mantra Restaurant & Bar) was awarded second runner up. Three generations dress traditionally for the event. 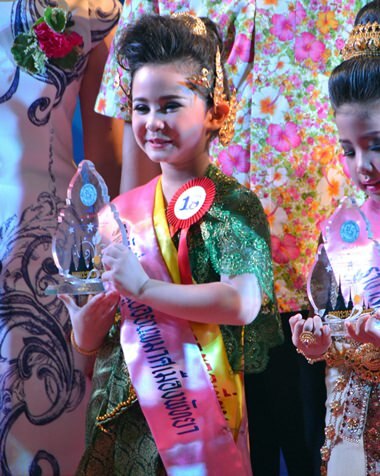 The little winner of the Pattaya Nong Noppamas contest. 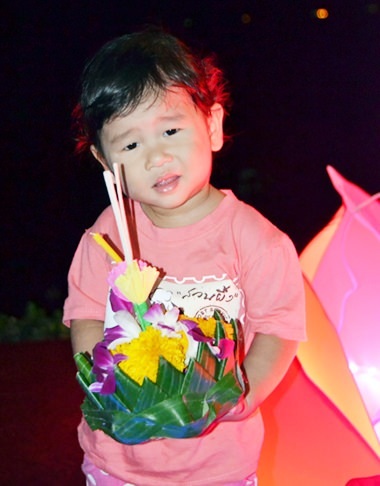 A boy poses before floating his krathong. Student teams celebrate winning the krathong contest. 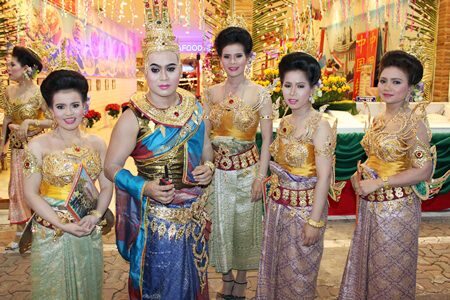 Boon Kanjanawararam Temple’s Loy Krathong event features Thai folk dance music. Children look for money from inside the krathongs. 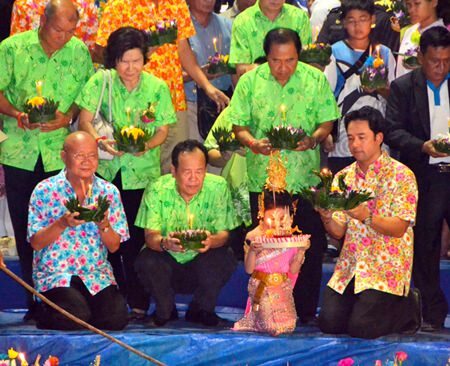 Chaimongkol Temple in South Pattaya hosted a grand Loy Krathong festival. 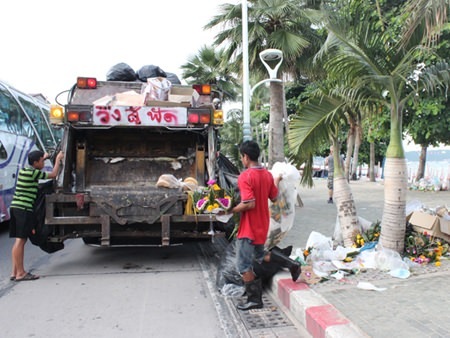 There is always a morning after – staff from the office of Public Health and Environment clean leftover materials used in making krathongs.